This debut novel was definitely a fascinating read. Full of mystery, intrigue, romance, and royalty that is sure to keep you coming back for more. Alera is Princess of Hytanica, the sworn enemies of Cokyri, and she's about to face her most difficult decision yet. Finding and marrying the man who will take over as king of Hytanica. It isn't until an intruder is captured in the castle, a boy not much older than Alera with alluring blue eyes, that things begin to change. Alera's struggle to follow her duty and her heart make things even more difficult, especially with the threat of another war between Hytanica and Cokyri on the horizon. Will the love she discovers prove to be a lie. 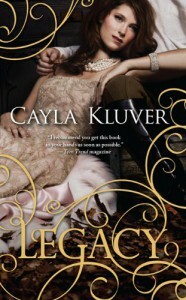 Cayla Kluver took me by complete surprise with this first book, and I absolutely loved it. The world she created with courts, pretty dresses, and royal duties was fabulously constructed and portrayed for readers. I loved the vast differences between the Hytanicans and the Cokyrians cultures including how men and women were viewed in each. The details that Cayla also used to describe the story were also remarkable done. Everything from the clothes they wore to the decorations of the rooms and meals they ate were thoroughly explored and beautifully laid out so that you could feel as though you were there experiencing it all. Once of my favorite parts though had to be Alera's strength. Though she knew what was expected of her, she still fought for more and be viewed as an equal. She wasn't going to be put on the sidelines at any moment. I loved her willingness to fight for true love and to be viewed as a capable woman with ideas and helpful ideas in a world that didn't see her that way. I was thoroughly captivated by this first installment of the Legacy Trilogy and definitely can't wait to read the next book, Allegiance. There sure to be even more intrigue and back story that I can't wait to uncover.